Lymphatic system. 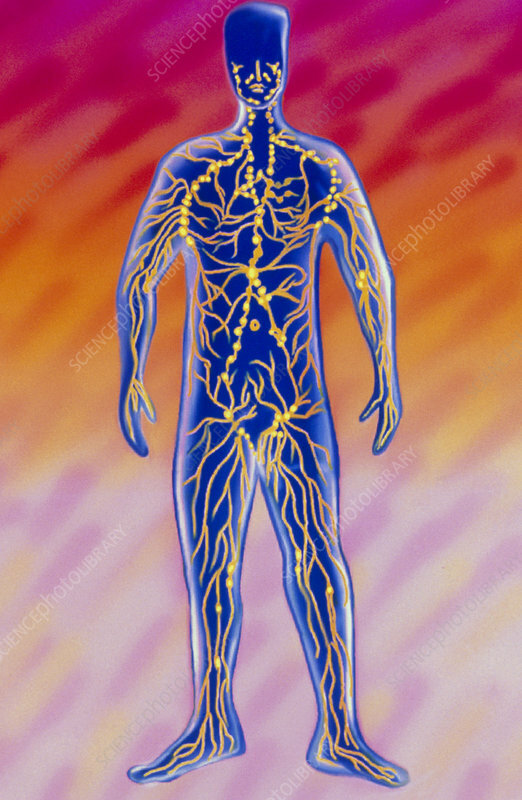 Illustration of the lymphatic system in a standing figure. The lymph vessels (yellow lines) drain fluid from body tissues and return it to the blood via a junction with a vein in the neck. The lymphatic system has no central pump equivalent to the heart, and depends instead on body movement and one way valves. Fluid passing through the system is filtered through dense clusters of white blood cells in the lymph nodes (yellow circles). The white blood cells remove and destroy disease-causing micro-organisms from the fluid, protecting the body against infection. The lymphatic system thus forms a major part of the body's immune system.